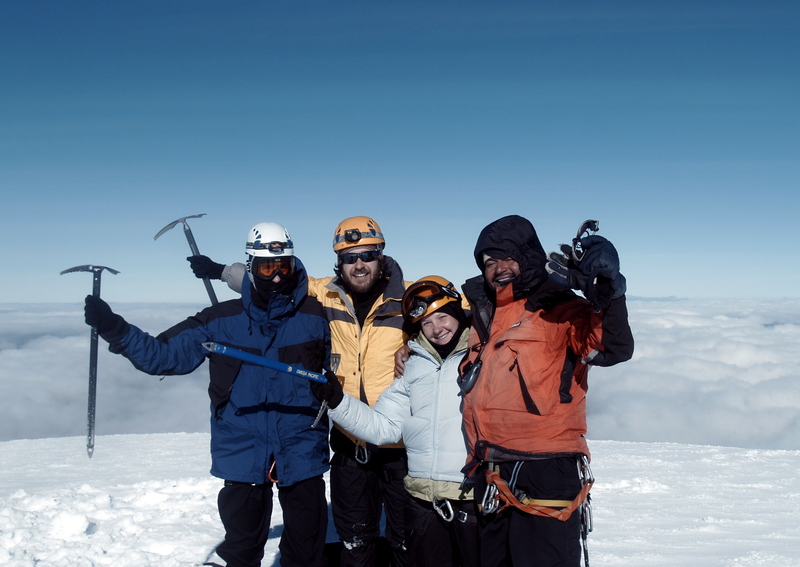 On the summit of Cayambe- 18,900 feet! Last summer, hiking in the Cascades and the Canadian Rockies, I kept finding myself in steep snowfields, wishing for an ice axe. In the mountains, an ice axe is essential for self-arrest: if you slip and fall on a steep slope and start sliding, a properly wielded ice axe can keep you from flying off the mountain. I mentioned my wish for an ice axe a couple of times on the Blonde Coyote (here and here) and apparently Drew was reading and taking notes, because this Christmas there was a Black Diamond Raven Pro Ice Axe under the tree for me! Let the ice axe-worthy mountain scheming begin! 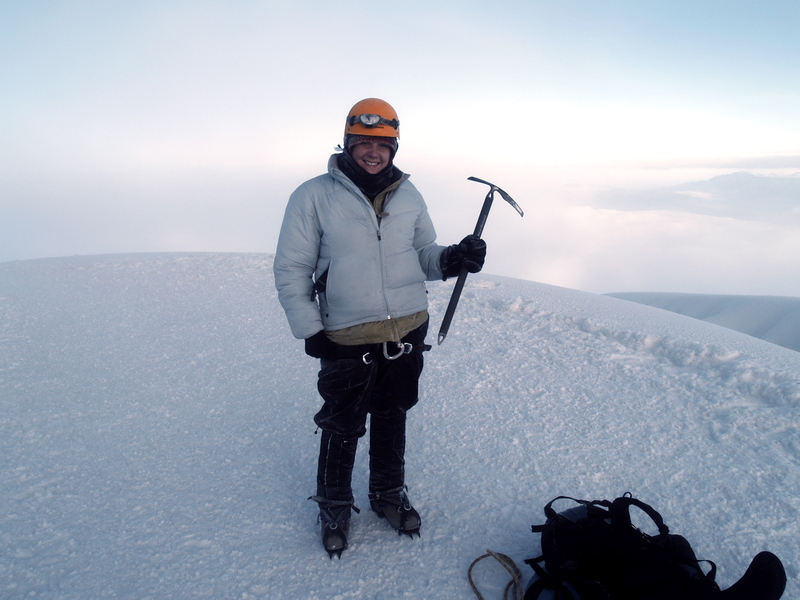 On the summit of Cotopaxi- 19,200 feet! From my award-winning mountaineering essay, The Suffer Fest: Climbing at night by headlamp is encouraging; it reduces the mountain to a more manageable size. The darkness keeps me from worrying about how I will survive the next 12 hours and forces my focus on only the bright patch of snow illuminated just in front of me. As I climb, my mind is on only my next few steps. The pace of mountaineering is slow and agonizing, almost elderly. It is too cold to stop and rest, so we must keep moving upwards, always. I fixate on the tortoise’s mantra: slow and steady, slow and steady. With each step I plant the spikes of my crampons firmly in the ice, and take a breath. Then I move my ice axe, impale it deep in the ice, and take another step and then another breath. I go on and on like this for hours, not climbing a mountain, but merely crossing a narrow circle of light. We started up the mountains at night so we could finish the climb and get off the glacier field before the afternoon sun started making the slopes too slippery. 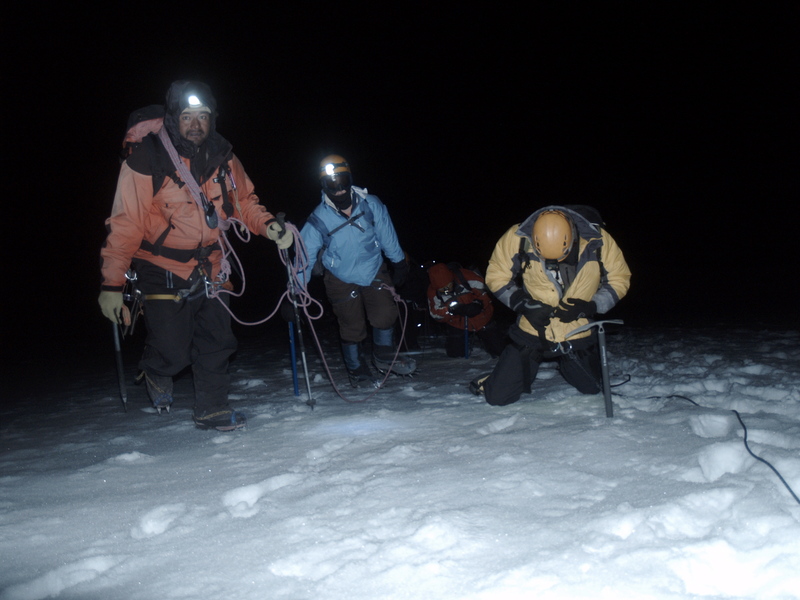 Following my rope team up Cotopaxi. Daylight brings a newfound fascination with the icy, alien world around me. I don’t know if it’s a second wind, or a change in attitude, but I’m finally able to ignore my miseries and just enjoy the experience of being on this mountain. We continue climbing, marveling at the massive ice caves, towering seracs and bottomless crevasses along our route. Occasionally we have to cross one of these giant cracks in the glacier and each time I hold my breath, try not to look down and leap across. 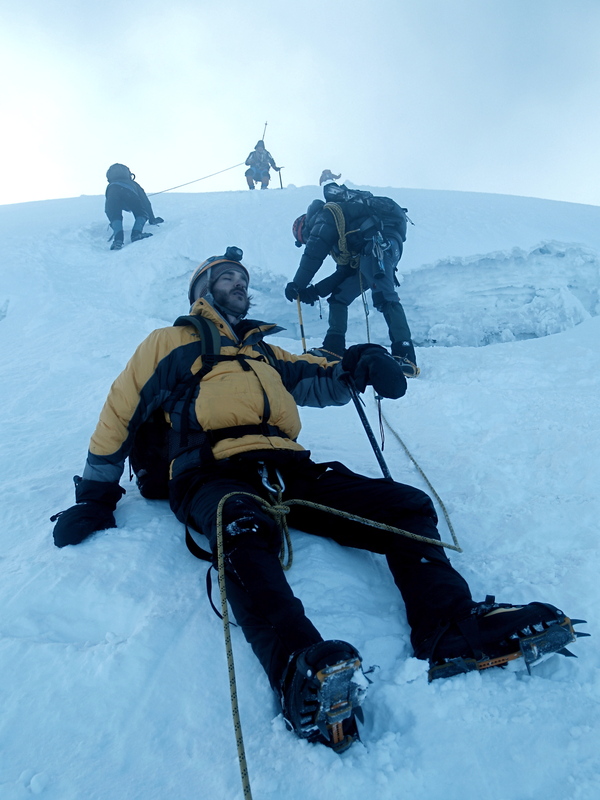 On one crossing, Colin misses the edge and falls into the crevasse up to his waist. I dive to the ground, shoving my axe firmly into the ice to anchor us and he climbs out without further incident. The Suffer Fest won a gold medal in Adventure Travel in the Fourth Annual Solas Awards for Best Travel Story of the Year and was published in the anthology Best Travel Writing from Travelers’ Tales in 2010. Read the rest and see more photos here. 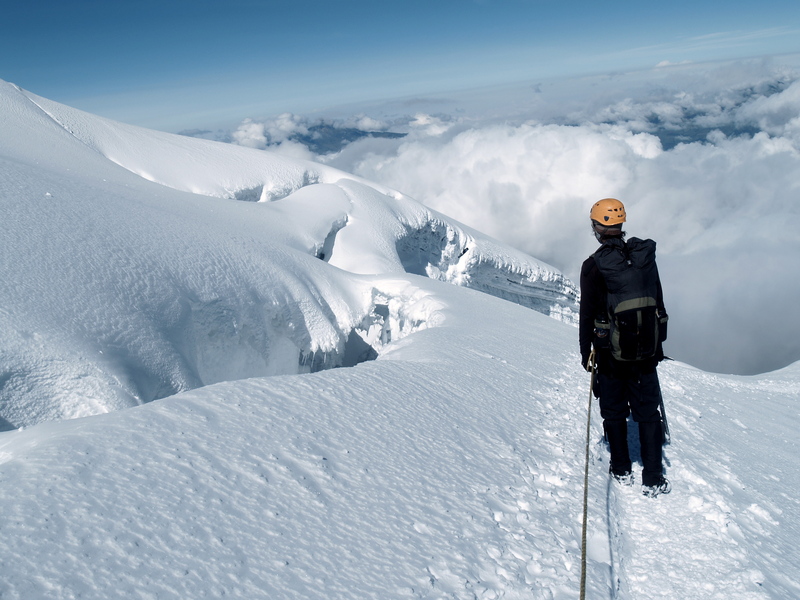 This entry was posted in Beyond the USA, Hiking!, Photography, Uncategorized, Vagabonding 101 and tagged Cayambe, Cotopaxi, Ecuador, ice axe, mountaineering. Bookmark the permalink. 9 Responses to Xmas Ice Axe! Will this be us making our way into the office next week??? Here’s hoping because this year the UK’s been too wet for any skiing ;o) Check out this blog for some amazing pics up the snowy rockies Cayambe and Cotopaxi. Hiya! I simply wish to give an enormous thumbs up for the good info you could have right here on this post. I can be coming back to your weblog for extra soon.